This observation tower along the Lake (Yellow) Trail at White Memorial sits at the point where ice was taken out of the lake and sent to the ice house. This post marks a new partnership between Hiddeninplainsightblog.com and Litchfield.bz. 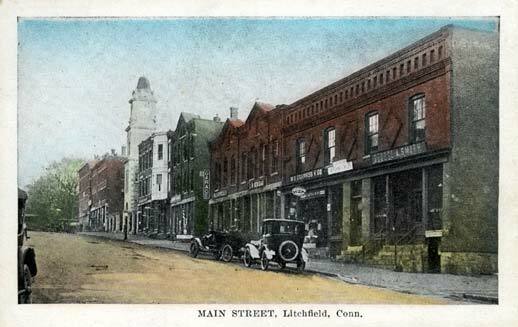 Litchfield.bz will occasionally be providing videos showing some of the sites discussed on this blog. In the days before refrigerators foods either needed to be preserved (through canning, smoking, or salting) or kept fresh through the use of ice boxes. Ice boxes were dependent upon a steady supply of fresh ice, no easy proposition in the summer months. To satisfy the demand for blocks of ice, ice was harvested from New England ponds and lakes in the winter (usually in January and February when temperatures were the coldest). Forty acres of Bantam Lake had to be harvested to fill the ice house. The earliest ice harvests were done in the same manner as harvesting crops, with neighbors and friends pitching in and being compensated with a share of the crop. Specialty tools, including gang saws, chisels and saw plows, were used to cut the ice into blocks which were then transported to ice houses for keeping. Ice houses were designed with the floor one foot off the ground to allow for the passage of air under the ice. They featured double walls, one foot apart and packed with shavings or saw dust for insulation. The floors of these ice houses were pitched to allow for drainage. 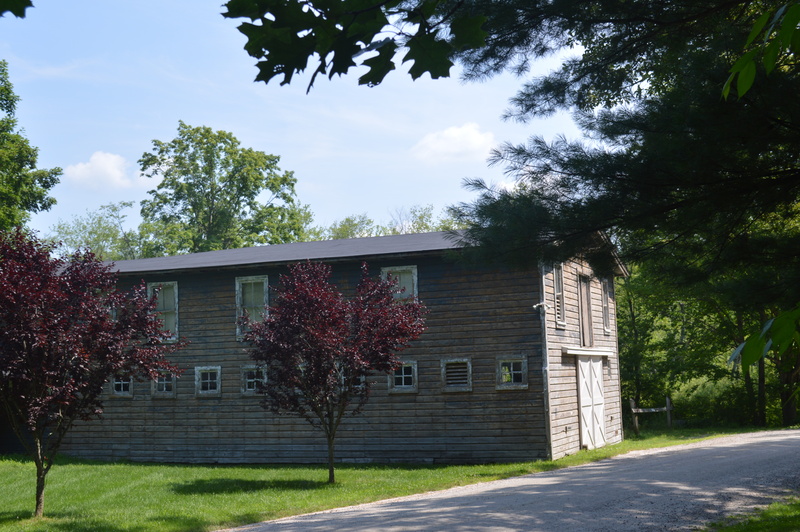 The former machine shop at the ice house complex. 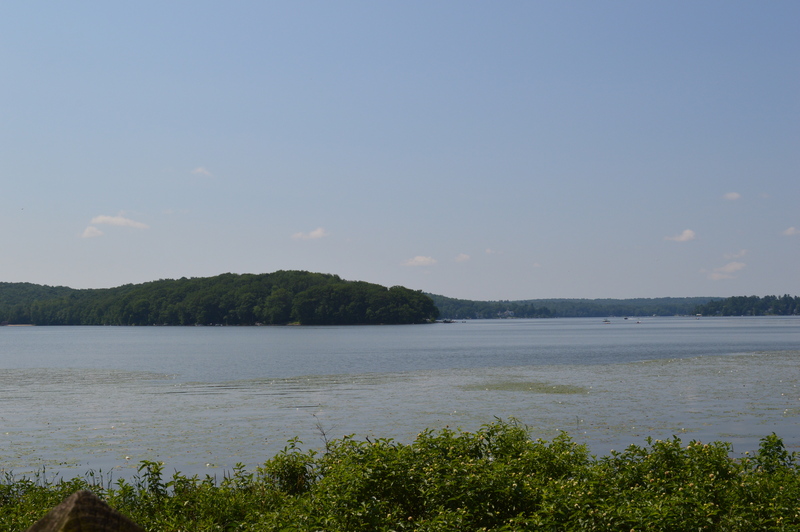 The largest ice harvesting operation in Connecticut was the Berkshire Ice Company (later part of the Southern New England Ice Company) on Bantam Lake. Their facility stood near the present Litchfield Town Beach on North Shore Road in Bantam. Here the foreman’s house and machine shop still stand, and the remains of workers’ dormitories and, most impressively, the 700 foot by 125 foot ice house are visible. The ice house had fourteen 30-foot high storage sections that each held 4,000 tons of ice for a total of 56,000 tons of ice. It would take 40 harvested acres of ice to fill the warehouse. The particular challenge the workers faced was getting the ice into the storage house. This was especially difficult as the ice was cut into the 300-pound blocks preferred for wholesale purposes. (Retail ice was cut into 25, 50, or 100 pound blocks). 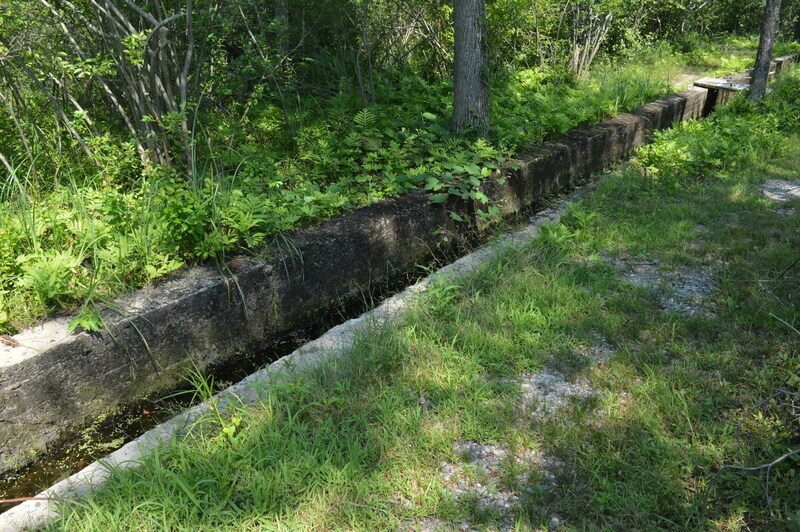 Prior to the conveyor belt system, ice was floated to the ice house via this canal. Channels were cut into the lake, and the workers (who were paid 60 cents an hour and worked seven days a week in the mid 1920s) utilized poles to float the ice to a ramp on which rested a conveyor belt. 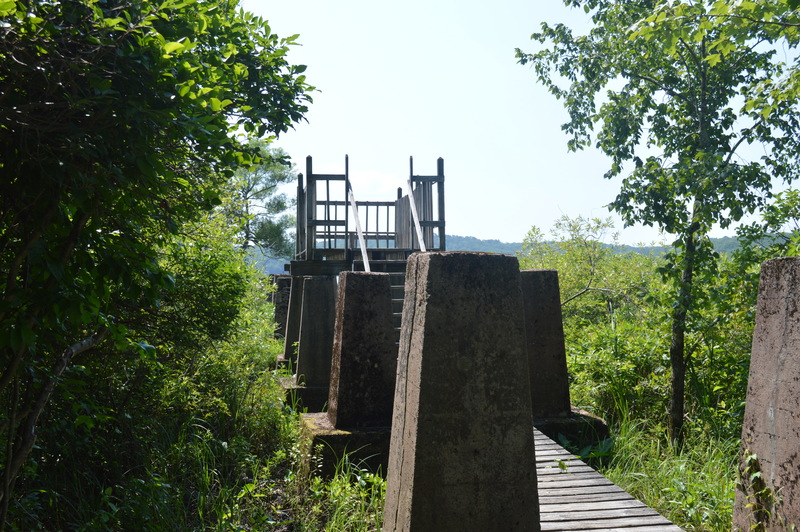 The concrete pillars of this system still stand as ghostly sentinels in the swampy grounds of White Memorial; the final pillars today support an observation tower on the shores of Bantam Lake. The conveyor belt was powered by a 100-horse power engine that derived its energy from the Bantam Falls power plant. 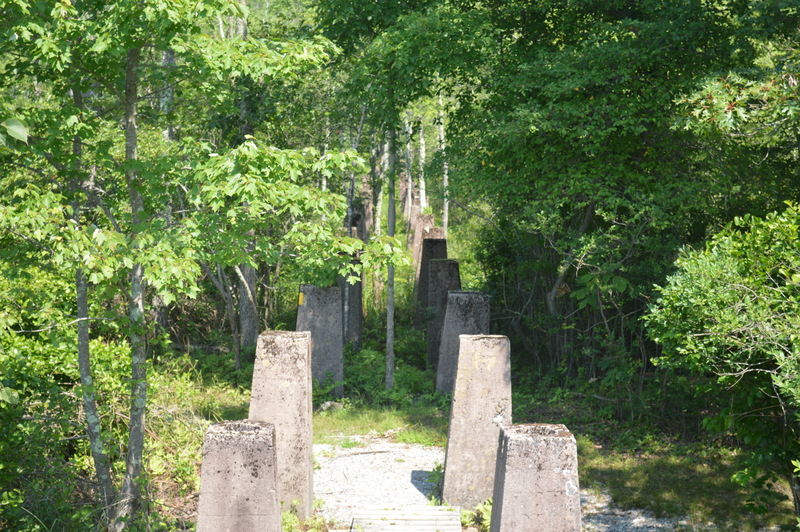 Concrete pillars mark the path of the old conveyor belt. 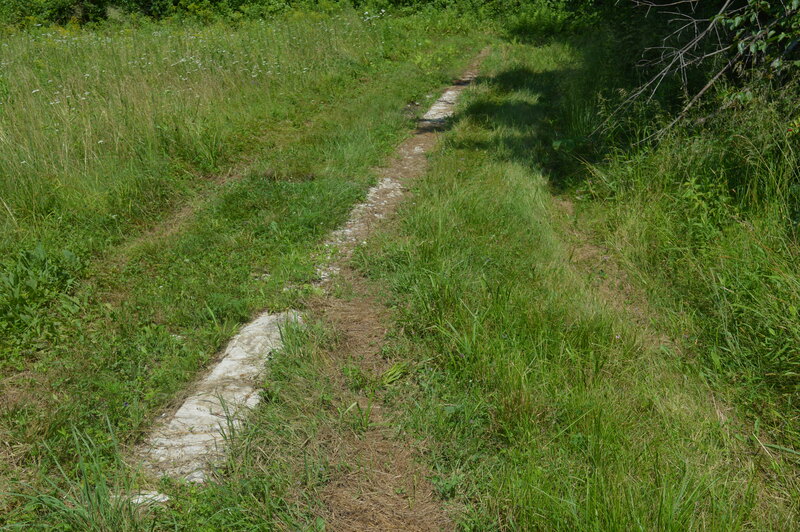 Remains of the ice house foundation, at the southern end of the Butternut Brook trail. The spread of electricity and refrigerators to households in the 1920s led to a severe decline in the demand for harvested ice. On August 8th, 1929, a massive fire swept through the facility. Some have speculated that the fire was caused by spontaneous combustion of either the hay or sawdust at the site, while others reported that their were several cases of arson in the area. Either way, over $350,000 in damages resulted from the destruction of the ice house building, nine railroad cars, and over 50,000 tons of ice valued at $200,000. The next year the Southern New England Ice Company sold its land to the White Memorial Foundation; as a result, the foundations remain to remind us of this once vibrant industry. This entry was posted in History, Nature, Uncategorized and tagged Bantam, ice house, Litchfield, White Memorial by pvermily. Bookmark the permalink. Nice piece. We have some new info regarding the canal at the WMF ice house ruins. Let me know if you are interested.